The BABY & ME – Tobacco Free TM is a FREE program to help pregnant women quit smoking during pregnancy and stay quit after the baby is born. A pregnant woman will attend four prenatal sessions to receive support and education. After the baby is born, the participant will return each month until the baby is 12 months old. At each session, the participant will take a carbon monoxide (CO) breath test that checks to see if she has been smoking. A participant will receive a $25 diaper gift card for attending each of the first three prenatal sessions. If a participant tests tobacco free by prenatal session four and during the 12 postpartum sessions, she will get an additional diaper gift card for each session. Diaper gift cards can be redeemed for any brand or size of diapers or wipes at local Walmart stores. Any pregnant woman who is a daily smoker or quit within three months of becoming pregnant. Must be less than 34 weeks pregnant at enrollment based on due date. Any age or income level is eligible. A smoker who lives with a pregnant woman that is currently in the program can also enroll as a Support Partner. If the support partner successfully quits smoking, she/he can receive monthly diaper gift cards during the postpartum sessions. 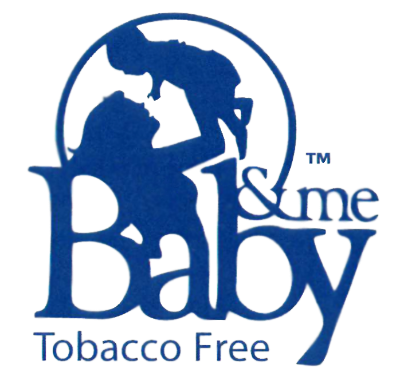 For more information about the BABY & ME – Tobacco Free TM program, visit www.babyandmetobaccofree.org.